A chapter book about a young fairy’s adventures between two worlds. Rauscher (Matchmaking Fairies, 2011), in a thin but ambitious paperback, introduces her audience—pre- and early readers—to Pixie, a fairy living in the clouds, who falls to Earth and is taken in by the Dixons, a ranching family in a small town. 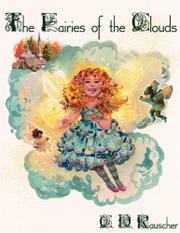 The book follows Pixie, whose duties include “fluffing the clouds” of her floating kingdom. Pixie, while supervised by the fairy Cloud Master, spends most of her time singing in a soft, tinkling voice and playing and wandering, from her first befuddling steps on Earth to a full life away from the clouds. After repeated clandestine trips to visit the Dixon family, Pixie’s magical qualities begin to fade. The Cloud Master tells her that she may choose either to remain a fairy of the clouds or lead a human life—with a little extra fairy dust for emergencies. Pixie charms the Dixons with her beauty, her endearing curiosity about animals and her puzzling affinity for chores. The simple depiction of childhood scenes—and the absence of over-intellectualizing or moralizing—adds a warm lightness to the tale. However, the author often errs on the side of simplicity, failing to provide sufficient vibrancy to characters and details to the worlds (above and below) that she paints. The book’s five sweet but unremarkable illustrations may not be sufficient fillers for younger readers, and the “Questions to ask in preparation for the next chapter” give away too much. Stronger editing would improve the text.